The first installment, A Mad Irregular Battle, introduced readers to the major characters of this sweeping drama and carried them from the Union crossing of the Tennessee River in August 1863 up through the bloody but inconclusive combat of the first and second days of the battle (September 18 and 19, 1863). Glory or the Grave, the trilogy s second volume, focused on September 20 the decisive third day of fighting that included the Confederate breakthrough of the late morning and the desperate Union final stand on Horseshoe Ridge. This installment drew to a close at nightfall. Barren Victory, David Powell s final installment, examines the immediate aftermath of this great battle with unprecedented clarity and detail. The narrative opens at dawn on Monday, September 21, 1863, with Union commander William S. Rosecrans in Chattanooga and most of the rest of his Federal army in Rossville, Georgia. Confederate Gen. Braxton Bragg has won the signal victory of his career, but has yet to fully grasp that fact or the fruits of his success. Unfortunately for the South, three grueling days of combat has broken down the Army of Tennessee and made a vigorous pursuit nearly impossible. In addition to carefully examining the decisions made by each army commander and their consequences, Powell sets forth the dreadful costs of the fighting in terms of the human suffering involved. Barren Victory concludes with the most detailed order of battle (including unit strengths and losses) for Chickamauga ever compiled, and a comprehensive bibliography. 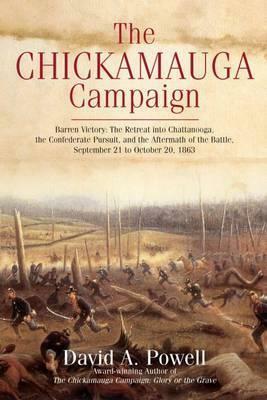 David Powell s The Chickamauga Campaign Trilogy is now complete, with the fighting in the hills and valleys of North Georgia finally receiving the extensive treatment it has so long deserved."